The international NEPS conference series at the Leibniz Institute for Educational Trajectories (LIfBi) brings together scientists from different disciplines and from different stages of their academic careers to discuss current projects and findings in educational research. The framework for this event is provided by the National Education Panel Study (NEPS) with its six panel cohorts and its rich research database on competence development, educational processes, educational choices, and returns to education in formal, non-formal, and informal contexts. For more information, please refer to www.neps-data.de. Empirical contributions on all NEPS-related topics, including methodological issues, are welcome for paper or poster presentations. The analyses to be presented do not necessarily have to be based on the NEPS data. A special focus of this year's conference is on international comparative approaches. The program will feature at least one keynote lecture on this subject and a corresponding paper session. The traditional award ceremony for the best NEPS publication and a round table with the Research Data Center team complete the agenda. 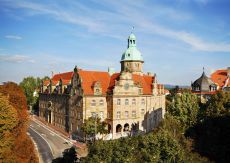 The conference is held at the Leibniz Institute for Educational Trajectories in Bamberg. Conference language is English.